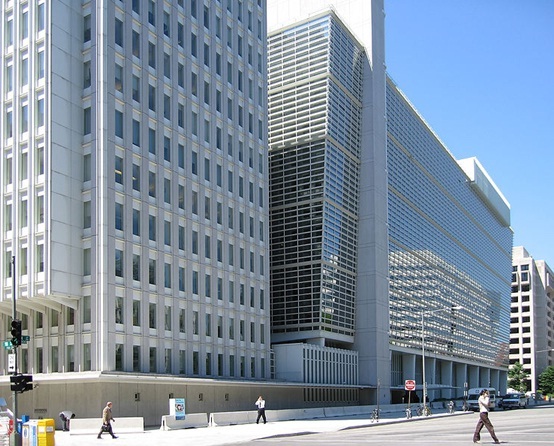 A recent article by allafrica has highlighted a significant stumbling block in Namibia (and Africa’s) wider goal to tackle illiteracy and poverty; namely, that the cost of education is too much for many people to afford. High school costs means fewer pupils can attend lessons. Maurus Nekaro, the Governor of Kavango Region in Namibia, spoke of how education costs are far too high to be inclusive. Nekaro also pointed to the importance of incorporating media and communications technologies into education in order to enhance studies and facilitate rapid progress. Of course, such technologies cost money and, with fees already on the rise, would such proposals further inhibit the affordability of education? Nekaro’s comments come at the same time as another headline: tuition and hostel fees at the Polytechnic of Namibia are to rise by 7% and 10% respectively from early next year. Such an increment has enraged the Student’s Representative Council who believe they will see no improvement in the quality of services at the Poly. Members of the Student’s Representative Council have already complained of small classrooms and overcrowding. With the cost of education set to soar in Namibia, questions arise as to how this will affect wider access to post-secondary education in the country. In order to tackle illiteracy and poverty, affordable education must be a higher priority. ” Getting ready for my daily walk in the park with Jolandie’s favourite hound this morning, we were chatting about the night that was and the day ahead. She wasn’t feeling great – she’s fighting an awful cold and had a restless night. However, she was up and going and had already passed N’zeto! And then I got the message I had always been dreading. Funny, I was never concerned about Jolandie being abducted or taken hostage or anything like that. Not only because of the excellent tactical training she received from Tacmo, but also because of who she is. She is incredibly level-headed, she always remains calm, she is brilliant at thinking on her feet and she has a mental fortitude way beyond her years. I always felt that she would cope better than most in a sticky situation. However, I always feared most for Luna’s safety. I forever implored her to tie a piece of string to Luna and to her wrist when sleeping in her tent out in the open!! But I somehow never thought Jolandie and Luna would be parted the way they were today. There she was, coughing and cycling along when she heard a vehicle coming up from behind and slowing down. Nothing unusual about this – well-wishers and good Samaritans do this all the time. A black Ford ‘bakkie’ (small truck thingy for the non-South Africans) with four youths pulled up alongside her. They motioned for her to get off her bike, laughing and joking. Jolandie thought they were inebriated and at first thought it all a joke. But when they got out of the ‘bakkie’, flashing knives and pangas, she knew it was no joke, though they were still laughing. Quick thinking Jolandie said she wanted to keep her handlebar pannier as she had food in it. There was some food in it, but also her passport and money! And she also took her one front pannier – the one with her toiletries in!! What a girl!! Have passport, money, food and toiletries – can travel!! Good thinking!! When the ‘bakkie’ with the laughing, inebriated youths and Luna disappeared over the horizon, Jolandie realised it wasn’t just a prank. This was for real. She started making her way back to N’zeto on foot, feeling vulnerable and shaken. Hvir and I were pacing up and down because Jolandie was in an area where the cell phone reception was exceptionally bad and I couldn’t get hold of her to talk to her. I had to rely on the odd message she managed to send when there was a bit of a signal. Werner, one of her friends in Lobito contacted someone in Soyo who doesn’t know Jolandie from a bar of soap, but he immediately started driving to N’zeto. 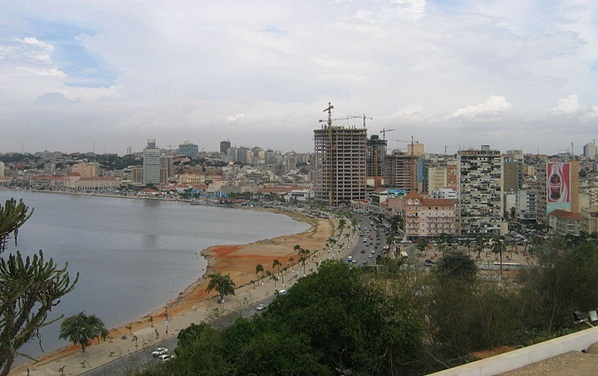 Between Candido, her hosts in Luanda and Pedro, her contact at Hoteis Angola – her kind and generous sponsors in Angola – the Zaire province police commander was contacted and the N’zeto police was sent looking for her. Now, and this is the part where all South African’s jaws will drop, not one but TWO helicopters were dispatched from Luanda to go and look for the perpetrators AND road blocks were immediately set up on all roads leading north looking for Luna!!! And by all accounts, if the perpetrators do get caught, they’ll sober up VERY quickly, lose their smiles and probably some other body parts too!! Jolandie will be staying with the governor for the next two days while the search for Luna continues!! And while she recovers from her dreadful cold!! I am truly and utterly stunned, amazed and humbled by the generosity, kindness, love and gentleness that is being bestowed upon her by so many, until recently, complete strangers in a foreign country. And so incredibly saddened that ‘them criminals, they are everywhere’. 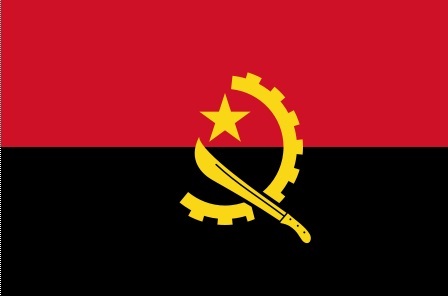 I know I speak for Jolandie when I thank everybody, the incredible people in Angola, the wonderful facebook friends and many others who have been sending good wishes and support. You guys are all awesome and without people like you in her life, none of this would have been possible. I’m very pleased that Jolandie has a warm bed to sleep in tonight and is being taken care of, but feel sorry for Luna who is with unkind and malicious strangers!! But Angola seems to be the country of miracles and it would not surprise me in the slightest if I’ll be sitting at my computer in the early hours of tomorrow morning informing you that Luna has been found!! Tonight I would not only like to thank Hoteis Angola for their incredibly generous financial sponsorship, but also for pulling out all the stops today to take care of Jolandie today. 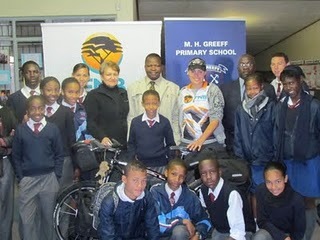 What an example of what sponsorship is all about!! 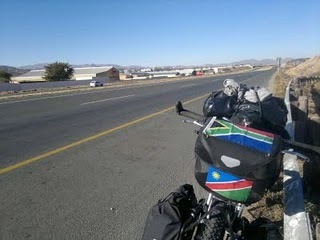 Sat 16th: Saturday’s leg was from Windhoek to Okahandja – 73km. A fine day on the road. Re-starting the journey was certainly tough on Jolandie’s muscles! She camped out, at the Kings Highway Rest Camp next to the road, with Luna happily sleeping next to he. 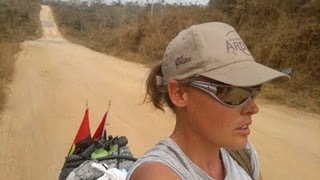 Jolandie is really looking forward to crossing into Angola!! Sun 17th. On this day Jolandie conquered a couple of Category 2 climbs. A Cat 2 climb is in simplest terms a climb of 500-800 meters. Well done Jolandie! 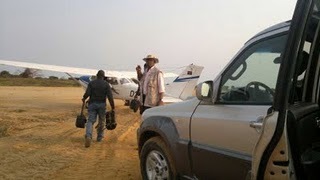 The last week has been a tough journey to beat the clock so she can cross over to Angola in good time. Make sure you tune in every Thursday to Jacaranda FM to hear the latest updates of Jolandie’s journey. 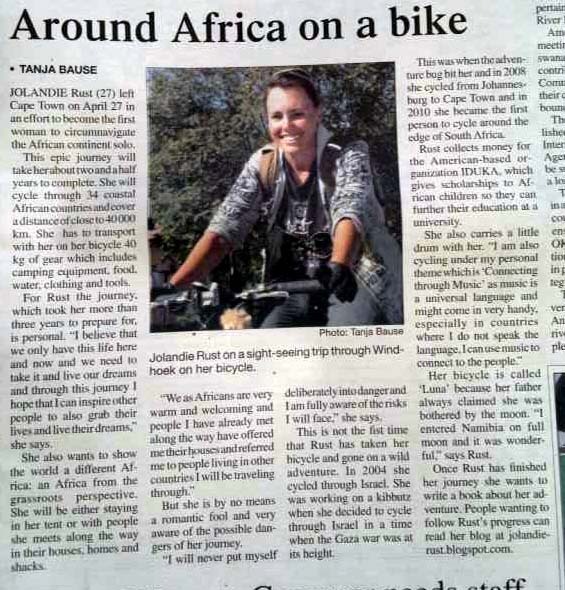 The article naming Jolandie Rust as Huffington Post’s ‘Greatest Person of the Day’ was a great kick-start to Jolandie’s tour as she heads back to Namibia tonight to continue onwards on her Cycle for Education. Jolandie’s trip – as we are all agreed – is a challenge that will present physical and mental obstacles for Jolandie along the way, but it is an important journey that will highlight the Iduka’s cause of higher education in Africa. Some of the comments posted in response to the HuffPost article however, were a little disappointing and, frankly, narrow-minded to say the least. Unfortunately there are many individuals in this world who are not able to expand their world view and embrace positive humanitarian actions when they are faced with them. Moreover, such people often cite false stereotypes in defence of their arguments. I think it is important to challenge these misconceptions about Africa, and about Jolandie’s tour, head on. It is also crucial to look behind the act of Jolandie’s Cycle Tour of Africa, and embrace the rich opportunities that higher education can offer African peoples. Firstly, Africa is a vibrant continent, combining cultural diversity with warmth and welcoming spirit… Each country offers inspiration and opportunity in unique ways. Jolandie has experienced spontaneous acts of kindness from strangers throughout her journey so far already, even though it is still so early in the tour. 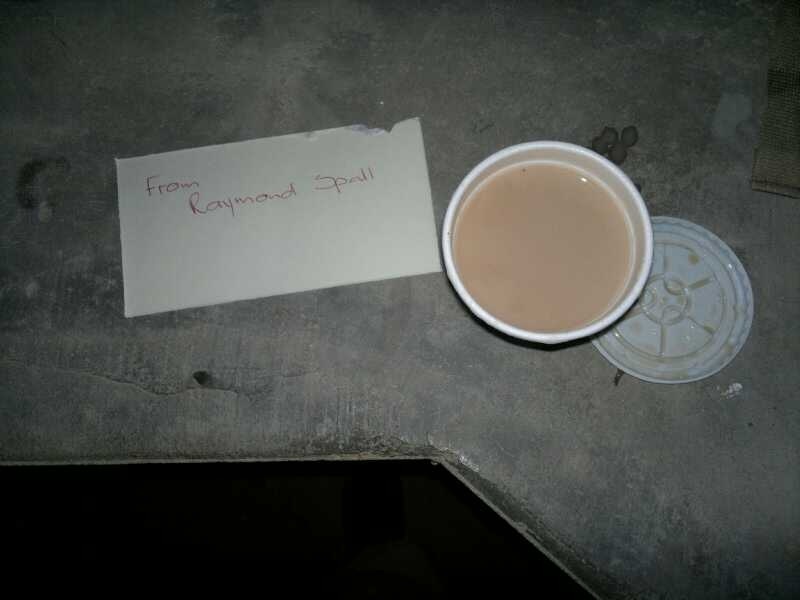 On her way to Windhoek, Namibia, a stranger by the name of Raymond Spall made sure Jolandie had a hot cup of Milo waiting for her at a pit stop along the way. In terms of education opportunities, inclusive organisations are inspirational gems. The Undugu Society of Kenya (a country yet to be travelled by Jolandie) has been empowering deaf children and young people from the slums and streets of Nairobi since 2008. These deaf children and young people have enjoyed increased opportunities with such an organisation, including: accessible primary education with their peers, advocacy skills, and widespread integration (as they can teach their friends and teachers how to sign). Iduka wants to build on these important foundational levels of education and increase opportunities for these disadvantaged youths in higher education. Also, it is undeniable that Africa is a continent that has faced its share of conflict… but which continent hasn’t? It is important for high-profile figures like Jolandie, organisations like Iduka and Undugu, humanitarian individuals like Iduka’s volunteers, and – most importantly – students like Iduka’s scholarship recipients, to continue to champion unity, education and equal opportunity. Crucially, it is these sorts of individuals that make up the majority of Africa’s population – kind, intelligent individuals that care about the educational development of their continent. One of Iduka’s scholarship students, Neville Albert, is a keen film-maker and has been involved in film projects that have highlighted the plight of disadvantaged individuals in Nairobi. Neville continues to work on ground-breaking film projects for Iduka – an African student championing African causes. 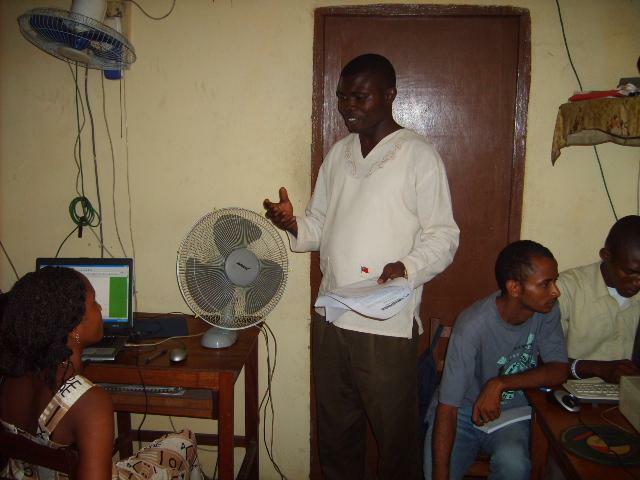 Iduka’s in-country partners Kisima of Kenya (led by John Ndegwa) and AID-SL of Sierra Leone (led by Sylvanus Marray) are dedicated local organisations that promote education and equal opportunity in their respective localities. Such organisations spring out of the care and compassion of their creators. Furthermore, Higher Education is a building block that will help make countries strong and nations great. It is not a lack of will or educational apathy that has prevented higher education expansion in Africa, it is simply down to a lack of opportunity. This fundamental difference is what drives inequality in each country and stifles the development of all nations (even in the UK, 15% of boys in the lowest socio-economic bracket do not attain the qualifications required to attend higher education. Such low attainment contributes to wider economic disparity between the rich and poor). Lack of opportunity has severe consequences. Studies have shown that mortality is highest among children born to illiterate mothers and illiterate fathers. Jolandie herself was unable to pursue a future in higher education in South Africa as it was unaffordable for her family – this is an opportunity-limiting factor that Jolandie is fiercely campaigning against in her Cycle for Education with Iduka. 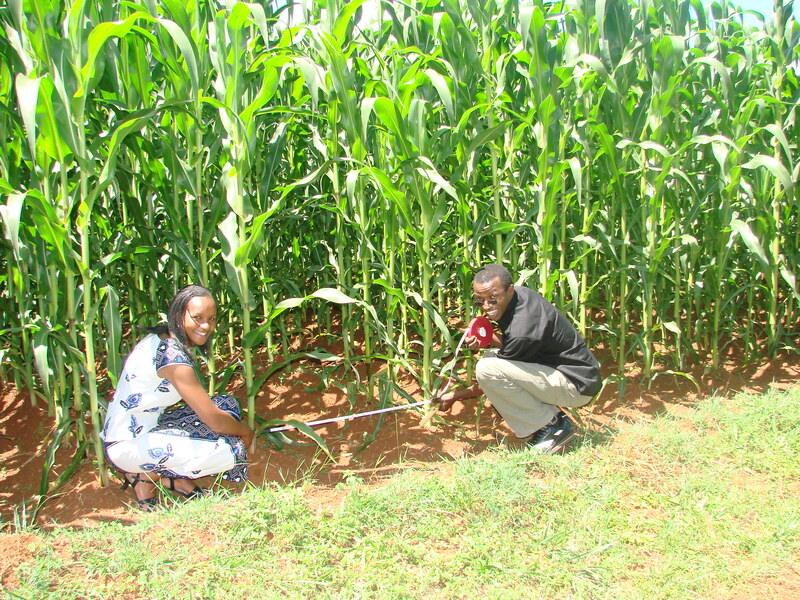 Importantly though, success stories are plentiful and increasing. In March of this year Somali-civilsociety.org reported that Somalian women in increasing numbers are being allowed to stay in school until their late teens. One of these school success stories is that of Harfo Primary School run by Galkayo Education Centre for Peace and Development or GECPD, a local NGO. Iduka, with its ever increasing number of volunteers, partners and student applications, is another one of these success stories. Opportunities ARE increasing, and it is down to individuals to be part of this change. Of course this list of African educational achievements and future targets is not exhaustive – with a continent so diverse I don’t think any list or one article will encapsulate what it really means to follow education in Africa. Nonetheless, it is vital to keep celebrating successes, challenging inequalities, and opening opportunities in whatever way possible – and this should all be done with a positive attitude! News in Cote d’Ivoire: ‘Back to School’ Initiative Launched. 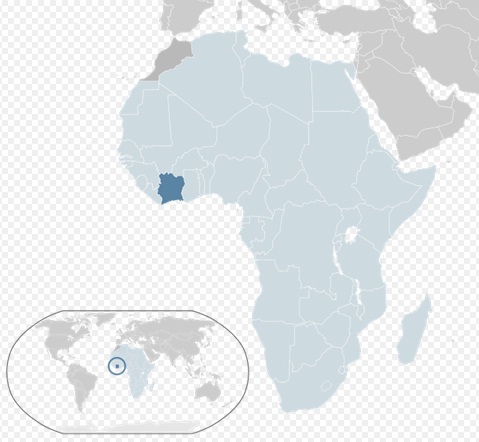 The five month political crisis in Cote d’Ivoire (West Africa) came to an end in early April; however a humanitarian crisis has increasingly spread. The Office of the UN Coordinator for Humanitarian Affairs (OCHA) says that hundreds of thousands of civilians are STILL displaced, more than two months after the former President Laurent Gbagbo surrendered. 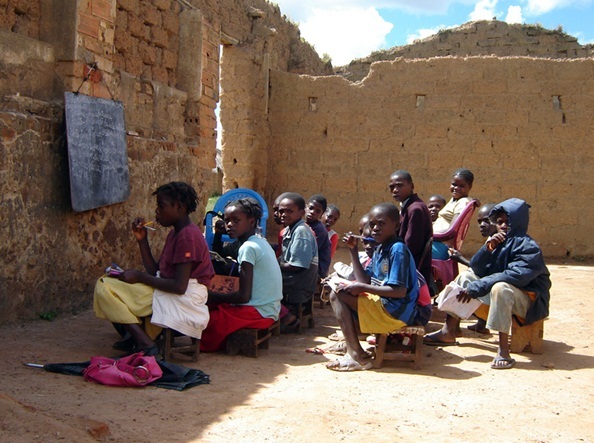 Almost a million children have been affected and over 15% are still unable to return to a stable education institution– many schools were looted or destroyed during the fighting. 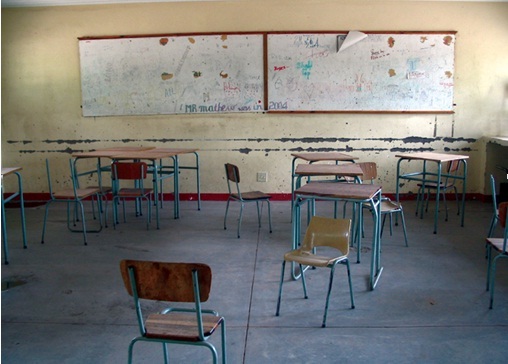 Moreover, many teachers fled the violence and have still not returned to their classrooms. There is a desperate educational need growing in the country. Exacerbating the problem is the underlying fact that the education system in the country was weak in the first place. 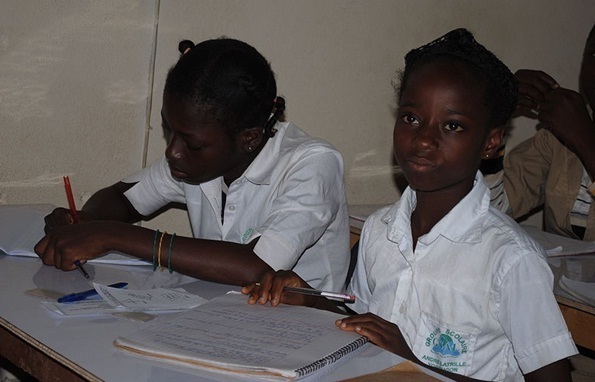 One million children in Cote d’Ivoire have never even been to school. Of the schools that have re-opened and are functioning in the Central, North and West areas, 83.1% do not have the required numbers of desks in classrooms and most lack sufficient latrine capacity, and potable water. UNICEF and the Ministry of Education have recently launched a ‘Back to School’ initiative which is attempting to address these problems. In conjunction with Save the Children, they are targeting one million children through social mobilisation efforts, by improving learning environments and investing in infrastructure. It is a promising project that should begin to lay the foundation for post secondary education in the country – only children that finish primary and secondary school can progress to a higher education future. We applaud UNICEF, The Ministry of Education and Save the Children in their efforts and we will continue to promote the post-secondary education message throughout Cote d’Ivoire and the rest of Africa. So, after a rollercoaster few weeks Jolandie has finally got her Angolan visa and is about to set off on her Cycle For Education Tour of the country. But just what can she expect education-wise? The Ministry of Education is based in Luanda, and in 2009 this Ministry made an agreement (with UNICEF) to provide quality education training to 8,750 primary school teachers over the course of three years. 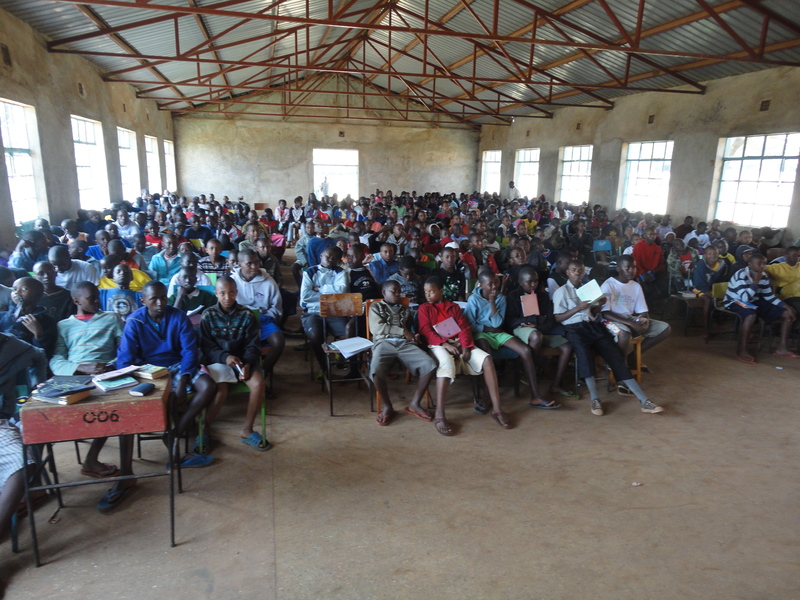 ** In addition, just yesterday, allafrica.com reported that over 1500 adults of the Chicomba district have been attending the second phase of a programme designed to fight illiteracy. Since the beginning of the programme, 6,500 adults have been taught to read and write. Although great progress clearly has been made in the country, there are still many challenges ahead. Primary school enrollment is at an all time high, however drop out rates keep increasing. Around 20% of males and 45% of females are still illiterate, despite the programmes implemented to directly tackle this problem***. The solution is not a short-term one but the focus on education is clearly present – I’m sure Jolandie will have personal insight into this situation once she gets back on the road. 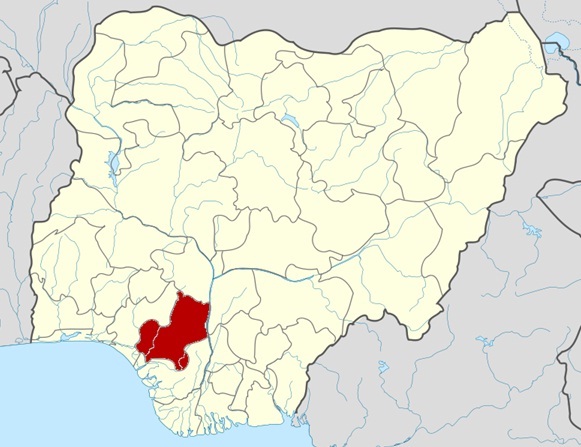 News in Nigeria: Foundation describes the condition of Edo State education as ‘deplorable’. Last Friday the TY Danjuma Foundation declared that the state of education in this region was alarming, despite huge infrastructural investment in the education sector. The TY Danjuma Foundation attributed the problem to an imbalance in the posting of teachers, and the poor construction of school buildings in rural and urban areas. In rural areas, the student-teacher ratio was found to be 160 pupils to 1 teacher, whilst in urban areas it was found to be 50 to 1. Although this indicates that there are more teachers in urban areas, there is a class size problem that desperately needs addressing. An oversized class means that not all of the children have fair access to the limited resources. Children that may initially struggle through classes do not get the one-on-one teacher care that their education requires, and they will become despondent with the system. 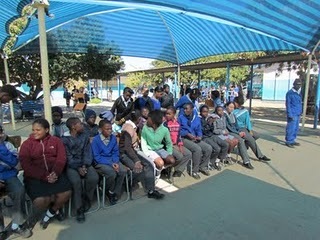 Few pupils in class sizes this large have aspirations of higher education, and they fail to reach their full potential. Moreover, the investigation discovered that secondary schools were woefully under-funded. Without resources, pupils cannot better themselves. There is no reading without books; there is no writing without pencils and paper. Such a situation means that secondary-school graduation rates remain low – further hampering opportunities for pupils to continue to post-secondary education. The TY Danjuuma Foundation have sponsored the Wing Community Development Project, which has supported over 2000 pupils through secondary and tertiary education – but there is still a long way to go, and the momentum must come from the state. 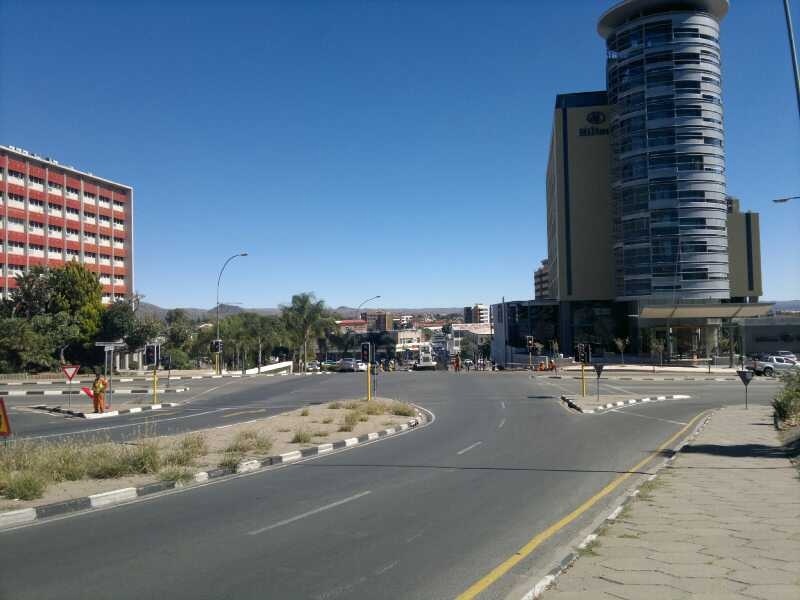 Jolandie arrived in Windhoek in fantastic time – but since her arrival in this great city, her luck has rapidly deteriorated. 1. Jolandie must have insurance (an issue that is well beyond the ability of Jolandie’s budget). 2. Jolandie must have a letter of invitation from an Angolan resident or organization, inviting her into the country. 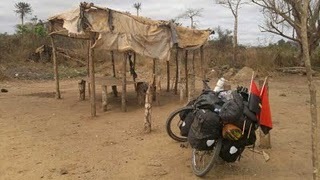 Whilst utilising all of her contacts to find an Angolan friend Jolandie managed to make the most of her Namibian stay. 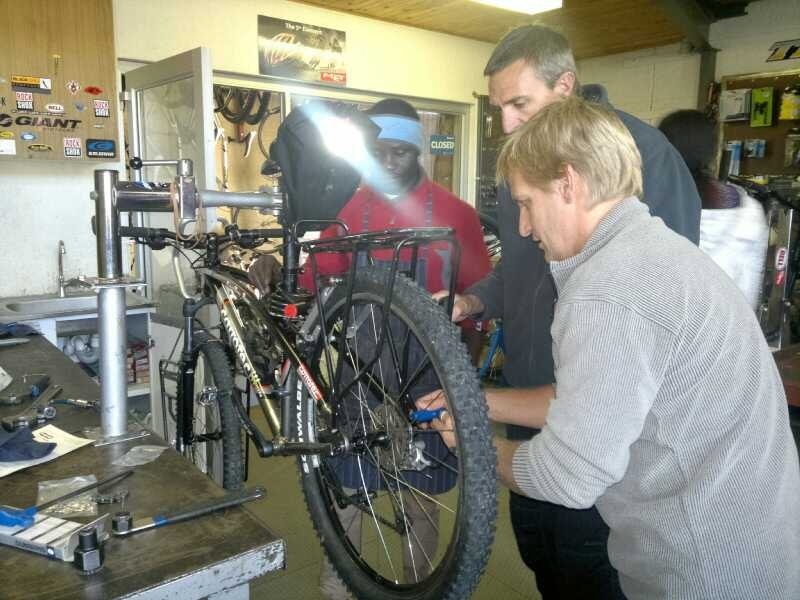 After having exciting interviews with radio station RadioWave and the newspaper The Namibian, Jolandie had a meeting with a potential sponsor and then she took her beloved bike Luna to Cycletec for some much-needed treatment. 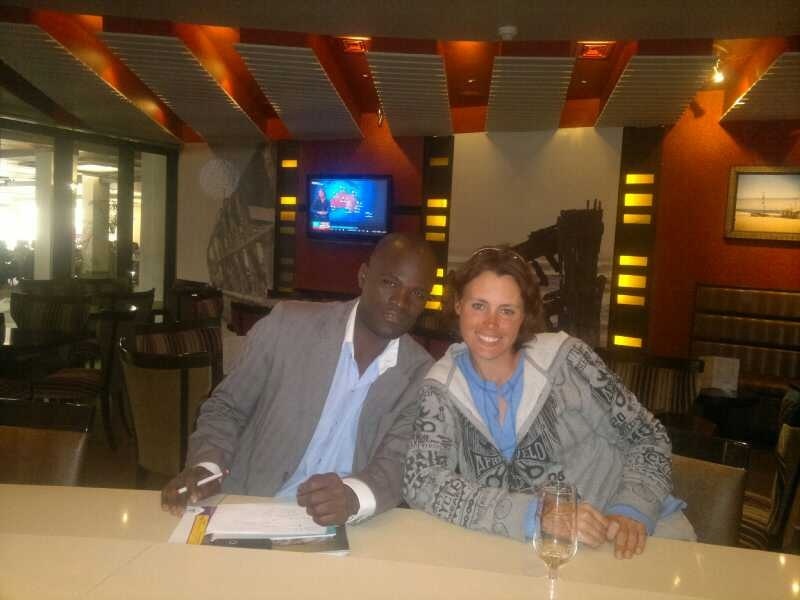 Of course, Jolandie made time to catch up with George – Iduka’s Namibian country coordinator. 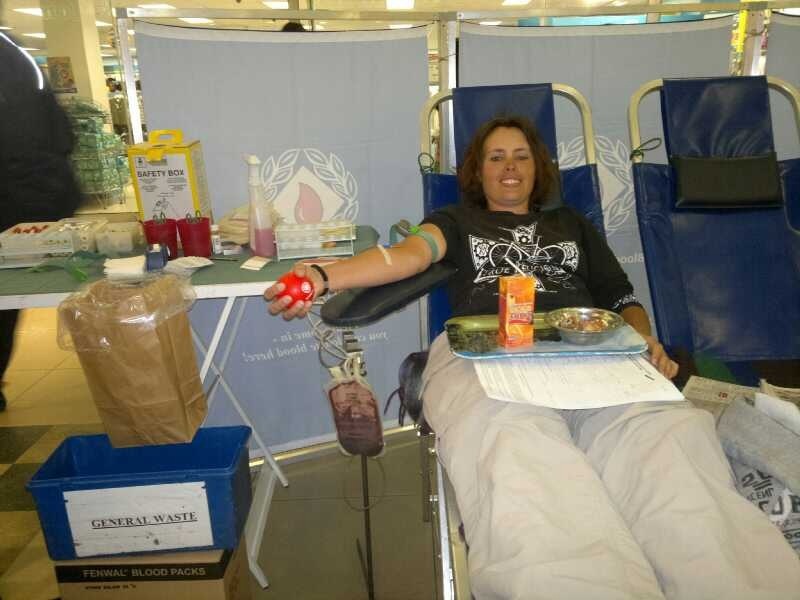 On Wednesday Jolandie managed to donate blood at a local shopping centre, she picked up Luna from the bike shop AND she managed to fit in an interview with the Republikein newspaper. Jolandie visited the Angolan embassy in Windhoek time and time again to try and sort the issues. On Friday she was informed that, on top of the other requirements, she would also need to apply for an extension on her Namibian visa. This is because the Angolan Embassy requires that Jolandie should have a 6 month visa in Namibia before she can apply for an Angolan visa. Fed up and frustrated, Jolandie was forced to take a flight back to Johannesburg. She is now home with friends and family awaiting an invitation letter from Angola (to arrive shortly) and then it will only take ten days for the Namibian visa to be processed. 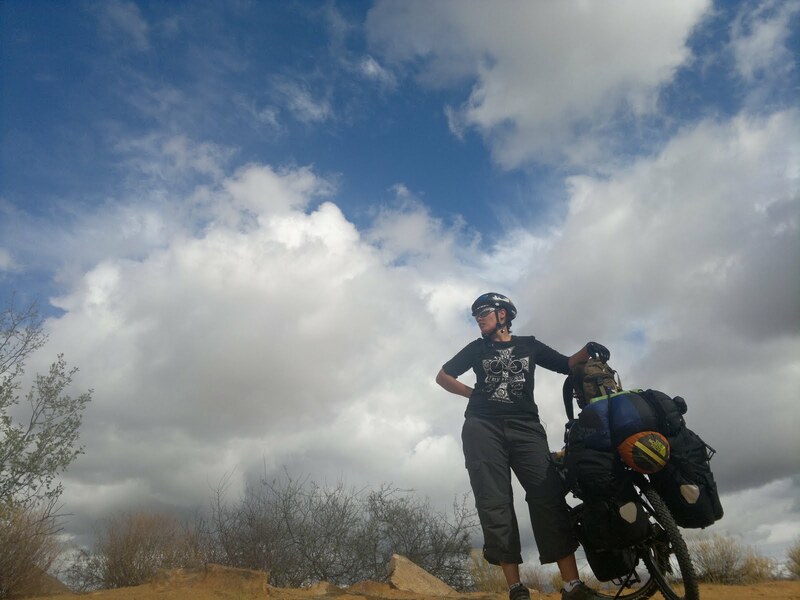 Jolandie’s bike and all her gear are still in Windhoek and of course, with her upbeat and energetic attitude, Jolandie shrugs this complication off as all part of the experience. Hopefully, she will be back on the road very soon and on her way to Angola.